Higher self-esteem. More resilience. Better manners. Rising grades. Increased vocabulary. Improved nutrition. What’s the one thing you can do for your kid that will deliver all these benefits? Serve family dinners. 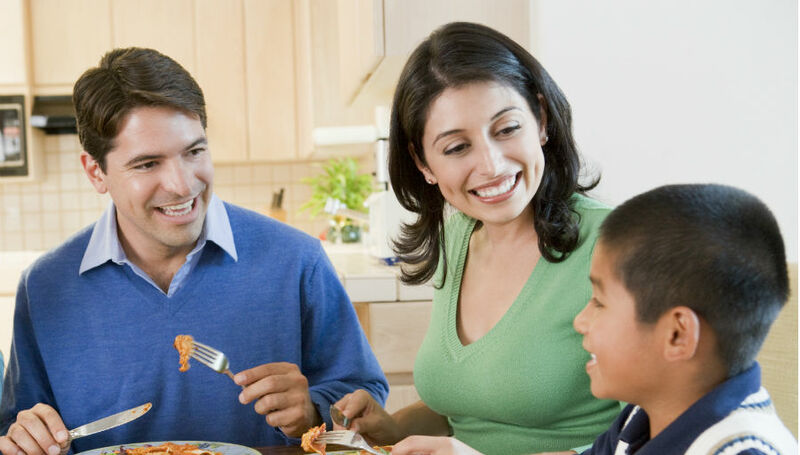 Here are five tips to make family dinner easier — and more fun. Kids thrive on routine. The stability of regularly eating together helps provide children with a sense of security that makes them feel safe exploring the world. You can even build rituals within the ritual — for example, taking time for a blessing before the meal or taking turns saying something you’re thankful for today. Focus on meals that are easy to cook and that include at least one thing you know everyone in the family will eat. And don’t make special dishes just for your kids. Exposure to new foods (not just chicken nuggets and pasta) without pressure to eat everything on the table encourages kids to be more adventurous. Plus, it’s way less work for you. Finally, remember that family dinner doesn’t always have to mean home-cooked. It’s okay to order in or heat up a frozen meal sometimes. It doesn’t have to be a three-course dinner every night, or even dinner at all. Eat breakfast together every day, or lunch on weekends, or dinner three times a week, or whatever you can manage. If one kid has weeknight practices, pack a picnic and get there early so you can eat together beforehand rather than eating drive-through in the car on the way. Even four-year-olds can help get out ingredients, grate cheese or tear lettuce for salad. Older children can learn to measure and stir, cut veggies or make pasta and sauce. When you teach your children to cook, you’re teaching them a skill they’ll use for the rest of their lives. Meanwhile, they’ll gain independence and you’ll get some family bonding time. Plus, kids are more likely to eat food they’ve helped prepare. Take turns picking background music to play during dinner. Ask your kids questions from Would You Rather? or Q’s Race to the Top On the Go Pack. Have a theme night — whether it’s Breakfast for Dinner, Purple Night, or Restaurant, where your kids serve you and clear the dishes. Finally, share your family history, including stories about your favorite toys, things to do and family traditions from when you were a child. Next: Bring conversation starters wherever you go with Q’s Race to the Top On the Go Pack or the new question cards on the free Q Wunder app!